Ox Ridge provides a number of membership categories to meet your individual or family needs. We pride ourselves in providing outstanding boarding, lesson programs, summer camps, services and supplies to all of our members at reasonable rates. 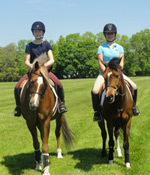 Membership levels include Active (full voting member with a share of the club ownership) to Lesson Program privileges. All Club privileges for member, their spouse, and unmarriedchildren under 28. Vote and share in Club. All Club privileges for a member, their spouse, and unmarried children under 28. All Club privileges for an individual member under age 21. All Club privileges for four months for an individual member. All Club privileges for a member of any age. Riding limited to Club horses.